Chantal Bourdeau, clinical-administrative coordinator of the Lachine Hospital; Dr. Pierre Gfeller, CEO or PED of the MUHC; Gaétan Barrette, Minister of Health and Social Services; François Ouimet, MP for Marquette; and Jacques Filion, Chairman of the Board of Directors of the Lachine Hospital Foundation. Health and Social Services Minister Gaétan Barrette and François Ouimet, Member for Marquette, visited the Lachine Hospital of the McGill University Health Centre (MUHC) on Thursday morning to announce that the business case for the Lachine Hospital modernization project, also known as HOP Lachine!, has been approved by the Gouvernement du Québec and that the execution phase can therefore begin. "The Lachine Hospital modernization project, which includes the construction of a brand-new building and upgrades to the historic building, is at last reaching the implementation phase," said Dr. Pierre Gfeller, President and Executive Director of the MUHC. “At the heart of this long-awaited transformation are patients and their families. From the very beginning, our patient partners teamed up with health professionals, hospital staff and planners to rethink the way care is provided so that services can be reorganized before designing the facilities. 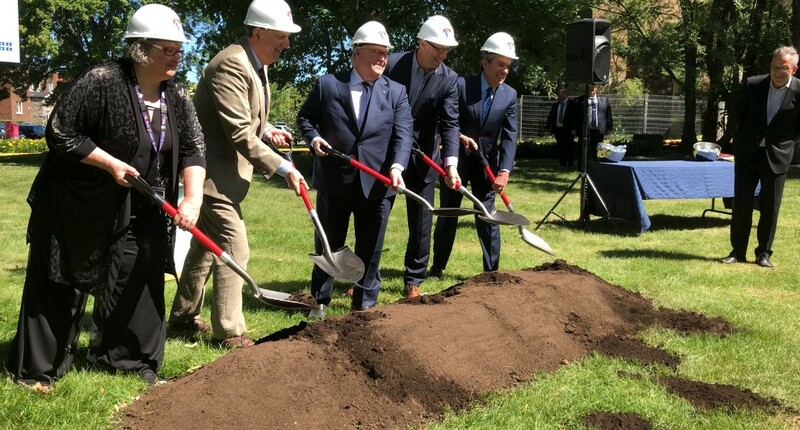 This collaborative effort has greatly contributed to the development of a solid plan that, once completed, will enable the Lachine Hospital to better accomplish its mission and improve the services it offers to the public. New pavilion: emergency room, intensive care, day hospital service, hospitalization, medical and surgical units, and palliative care.